Police in gang-ravaged Mexico have arrested an alleged hit man for a local drug cartel in the case of the 43 abducted college students. The September disappearance and subsequent events saw the entire country erupt in protest over a corrupt government. The suspect, Felipe Rodriguez, arrested Friday, belongs to the infamous Guerrero Unidos cartel, and goes by the nicknames ‘The Brush’ and ‘The Stubborn One.’ He is believed by authorities to be the “material author” of the mass killings that came to light when grisly graves started being uncovered. 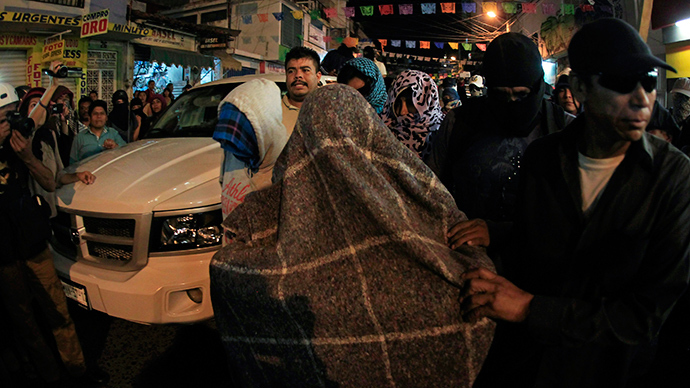 The official version so far is that the 43 students were grabbed by corrupt police at a local protest in the city of Iguala, Guerrero state, and then handed over to the ruthless Guerreros, who then allegedly killed them and burned the bodies at a trash dump, before dispensing of the remains in a river. People have been out on the streets ever since, across multiple states. The rallies often turned violent, leading to clashes with police, vandalism and injuries. The case not only reaffirmed the public’s fear of an overwhelmingly corrupt police force, but revealed corruption at the very top of the political ladder, with the Mayor and his wife now in custody for allegedly ordering the killings. The pair, Jose Luis Abarca and Maria de los Angeles Pineda, could not be detained – when the arrest warrants were issued, as they disappeared. Now the two are in a maximum security prison. Aside from the high-profile couple, 90 arrests have been made in the case, with the majority being municipal police officers. President Enrique Pena Nieto has vowed reforms. However, one of the sticking points is his proposal of a specialized federal force to take over in especially volatile gang areas – the idea had not garnered much support when traces of federal involvement also became widely suspected in the case. At this point, only one student’s remains match their DNA. Families and friends of the students have made it clear they place no trust in the official account of the disappearance. They insist on investigations being continued to get to the bottom of what happened to the other 42 students.